NOTIFICATION No. 1332 /ADMIN dated 10-04-2019 by DEO (W-EE) LAYYAH regarding Extension in Contract Basis Jobs of Educators Recruitment Policy 2014. The detail of this notification is here. In compliance with the letter No. SO (SE-III) 5-225/2017 dated: 28-03-2019 on the subject Regularization / Extension in contract of Educators Recruited in the year 2014 under Recruitment Policy 2014 issued by the Govt. 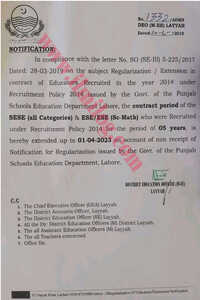 of the Punjab Schools Education Department Lahore, the contract period of the SESE (all Categories) & ESE/ESE (SC-Math) who were Recruited under Recruitment Policy 2014 for the period of 05 years is hereby extended up to 01-04-2023 on account of non-receipt of Notification for Regularization issued by the Govt. of the Punjab Schools Education Department, Lahore.